I thought this was supposed to work only if both partners selected world-famous celebrities in advance or if you’re like Larry David and it’ll never happen because you’re too hilariously neurotic. There’s something awfully quiet and mannered about this post-mumblecore trailer for a film by and co-starring Katie Haselton (“The Puffy Chair”) and it generally kind of rubbed me the wrong way. Maybe it’s Dax Shepard’s uncomfortable resemblance to Zach Braff. The Playlist seems to like the trailer and says the notices so far have been positive. Fair warning: those of you who have been chomping at the bit to see the much-vaunted “Seinfeld” reunion on this season of “Curb Your Enthusiam” had better cool your jets, at least for this week. Although the press (and I’m including myself in their number) immediately latched onto the season’s major plot arc and ran with it, there’s only the tiniest hint in tonight’s episode about the events to come. What we get instead is something which longtime fans of the series will nonetheless appreciate: a follow-up to the Season 6 finale. If you were there at the end of Season 6, then you remember that Larry, now separated from Cheryl, had managed to find an unexpected love connection with Loretta Black (Vivica A. Fox). Well, they’re still together, amazingly enough, but it’s hard to say how much longer the relationship is going to last. Part of it is because she’s starting to drive him crazy, but the other reason is…well, it’s better that you learn it for yourself. Suffice it to say that it’s a development which will immediately make you go, “Oh, God, this is going to be like Susan on ‘Seinfeld’ all over again…” Maybe it won’t be, but that’s certainly the first thing that leapt to my mind. There’s one thing that doesn’t work very well in the season premiere: the action performed by Loretta’s doctor which annoys Larry and thereby sets off the episode’s series of intertwined events. 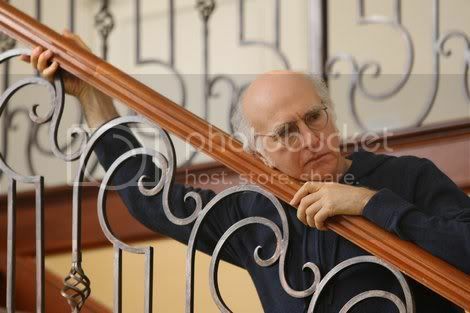 I think any “Curb” fan worth his or her salt knows that Larry’s pretty easily annoyed, often by the most ridiculous things, but it just isn’t as funny when Larry does something that you know you’d probably do, too. And, trust me, anyone would stand aghast at the doctor’s action. It’s completely inappropriate. Then again, when you think about it, there really isn’t that much about “Curb Your Enthusiasm” that is appropriate, so I guess it all works out okay in the end. 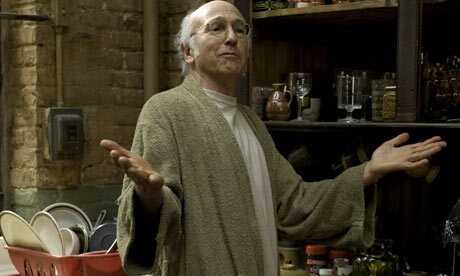 And, besides, as ever, it’s just nice to have Larry David back for another season. It occurs to me that, although I’m trying my best to cover the TCA tour in a chronological manner, there are some panels that you’d like to know about more quickly than I might otherwise get to them. 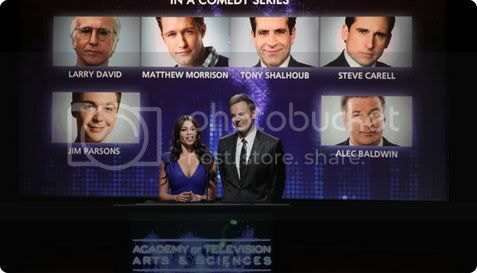 As such, I’m instituting a new category called the TCA Jump-Ahead. It’s kind of a running joke in the entertainment industry about how every season of “Curb” should be considered the last season of “Curb” until Larry David says otherwise…and, generally, Larry David is glad to tell you that he’s done, he has no more ideas, and he can’t be bothered to try and think of any. Thankfully, David announced last year that he would indeed be moving forward with a seventh season of the cringe-worthy comedy (and I mean that in the best possible way), and since then, there have been multiple rumblings about how various members of the cast of “Seinfeld” would be popping up. In the “Curb” panel yesterday, David finally provided some context to exactly how they’d be appearing. “For years, I’ve been asked about a ‘Seinfeld’ reunion, as has Jerry and the other cast members,” explained David, “and I would always say, ‘No, there’s no reunion. There’s not going to be a reunion show. We would never do that. It’s a lame idea.’ And then I thought, ‘But it might be very funny to do that on ‘Curb.’ And I kept thinking about the idea. I started to think of different scenarios and how we could pull this off. I called Jerry, and Jerry was game. And I said, ‘Well, I’ll call the others,’ and I did. And we did it. So we’re doing a ‘Seinfeld’ reunion show on ‘Curb.’ We’re going to see writing. We’ll see aspects of the read-through, parts of rehearsals. You’ll see the show being filmed. And you’ll see it on TV. And will there be any reference to Michael Richards’ sordid post-“Seinfeld” problems? The reunion is scattered through the season, and by David’s admittedly questionable recollection, the cast will be on five shows, though they won’t all be on the five shows. (“Jerry’s on five shows, I think,” he said. “The others will be on at least four. Maybe one or two of the others will be on five. I’m not sure.”) The season finale will be about the reunion show and will possibly be an hour long, though David admits that he hasn’t finished editing it yet and can’t say for sure. 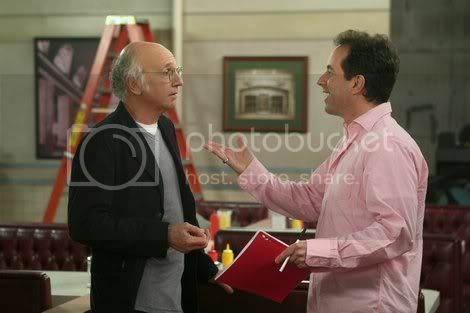 There’s just one thing, though: anyone who’s been watching “Curb” for the previous six seasons has to figure that the odds look good for Larry – the TV Larry, that is – to somehow screw up this reunion. Want a few more tidbits about the upcoming season…? Box office preview: The comedy calm before the “Transformers” storm? Awaiting the coming midweek arrival of the next big fanboy franchise entry, “Transformers: Revenge of the Carniverous Unicorns” or whatever it’s called, a couple of high concept comedies with theoretically strong potential sail into the nation’s multiplexes this weekend. While both should do okay business, the “meh” to “Cathy”-style “ack!” reactions from critics (I know we don’t really count but, hey, if you tickle us, do we not chuckle?) might indicate somewhat limited potential against the ongoing one-two punch of “The Hangover” and “Up.” I expect a close one. But then, I’m always wrong. Of the two new comedies, “The Proposal,” starring Ryan Reynolds as a put-upon assistant cajoled into a sham marriage with his you-know-what-on-wheels boss played by Sandra Bullock, appears to be the somewhat stronger contender. This initially struck me as something of a gender-reversed redo of Mike Nichols’ similarly high-concept 1988 Melanie Griffith vehicle, “Working Girl,” with the executives originally played by Harrison Ford and Sigourney Weaver mushed into Bullock’s publishing bigwig. However, the reviews indicate something darker at times, but probably less entertaining for a mass audience. With a 44% “fresh” at Rotten Tomatoes, mirrored by our own David Medsker’s split critical decision, critics are turning no cartwheels. The Hollywood Reporter however suggests that the film has some pretty serious date-movie appeal and that might be enough for $20 million or so, which might be enough to hit the #1 spot. Certainly many women may feel that, to paraphrase Griffith 21 years back, Reynolds has a mind for comedy and a body for sin. It’s therefore a good bet they subtly encourage their significant others to attend with them, who themselves might not mind looking at the adorable, if now fully adult, Ms. Bullock for a couple of hours themselves. We shall see. If critics were unconvinced by “The Proposal,” they were hurling ancient curses at what sure seemed to me like a promising comedy concept but, then, there’s the me-always-being-wrong thing. I speaketh of the hunter-gatherers-go-biblical “Year One,” directed by comedy veteran multi-hyphenate Harold “Egon Spengler” Ramis. The critics seem to agree that this vehicle for two of the best known names in youth-targeted comedy, Jack Black and the gifted savior of dry humor among the young, Michael Cera, is a million miles away from being Ramis’s best work. (That would include probably one of the beloved films of the last twenty years, “Groundhog Day” as well as the frat-boy touchstone, “Caddyshack.”) On the other hand, Variety offers the thought that it’s “tracking” is improving. I’m still trying to figure out what “tracking” actually means, but I guess that’s supposed to be a good thing. Year One is so dedicated to being historically accurate that it only uses jokes that are at least two thousand years old. Every era gets the prehistoric comedy it deserves. Meanwhile in arthouse land: The would-be prestige comedy “Away We Go” widens to 132 screens this weekend. Also, the week’s new limited release is yet another promising sounding attempt at America’s funnybone, the latest from Woody Allen (though apparently the original script dates back to the seventies), “Whatever Works” starring HBO’s own Larry David. Allen’s films are almost the definition of review-driven hits-or-misses and this one has engendered what is at best a split decision with 53% (only 9% among “top critics”!) at RT. That’s low enough to (forgive me, Lord, for what I’m about to say) curb filmgoer enthusiasm.